Molded-in wave baffles reduce wave motion, resulting in 40% less splashing for safer, cleaner, more efficient mopping. Heavy-duty, ergonomic wringer designed to exceed 50,000 cycles. Mop handle secures during transport, preventing damage to walls. Nonmarking 3 casters. Constructed of tubular steel and structural web molded plastic. 44 qt. capacity for larger, commercial cleaning jobs. 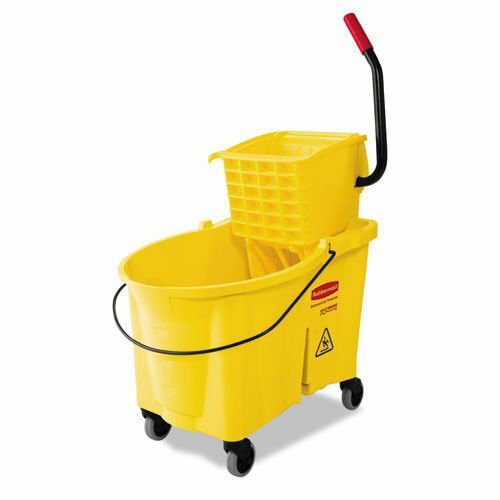 Accepts Dirty Water Bucket sold separately that offers separation for cleaner, less slippery floors. Convenient foot pedal drain for easy emptying with no lifting. Accommodates 16- to 32-oz. mop heads. Capacity Range Volume: 44 qt Depth: 24amp;quot; Width: 17amp;quot; Height: 38amp;quot;.